Dec. 19, 2018 – Two years ago Canadian Forest Industries and woodbusiness.ca shared results from an inaugural contractor survey that found Canadian logging contractors continue to struggle with logging rates, profitability and succession planning. To continue the conversation and record industry trends, this year we followed up with a second survey conducted in June 2018 by independent research firm Bramm & Associates. The survey generated over 275 replies to a detailed list of questions. Respondents were distributed according to the geographic breakdown of the forest industry, with 40 per cent in Western Canada, 25 per cent in Quebec, and the rest found in Ontario, Atlantic Canada, and central Canada. Within B.C. responses were split between the B.C. Coast and Interior. By comparing results from both surveys, it’s clear Canada’s contractors have roadblocks ahead of them if they are to have healthy, profitable futures in the industry. The number of loggers whose rates have not changed in five years has gone up since 2016. 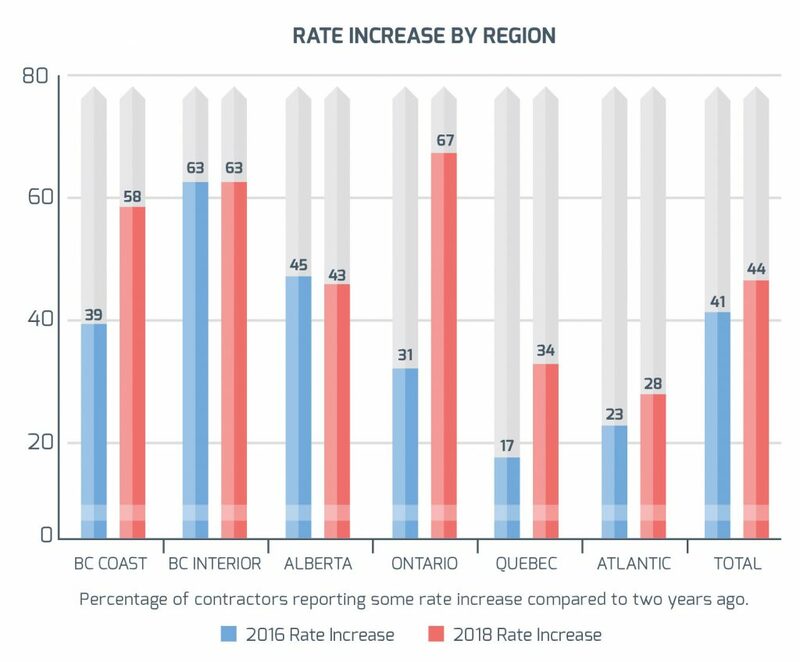 More than a third of contractors across Canada have seen no rate increase, which is eight per cent higher than the same response two years ago. On the other hand, fewer contractors have seen their rates drop from what they received five years ago. Just 11 per cent report a rate decrease in 2018 compared to 23 per cent in 2016. Atlantic Canada, Alberta and the B.C. Interior struggle the most with securing rate increases, while the B.C. Coast, Quebec and Ontario are faring somewhat better. More contractors and mill woodlands believe 20 per cent or more is a fair profit margin for loggers in 2018 compared to our 2016 survey, however most still expect a profit of between 11 and 20 per cent. We defined profit margin as return on revenue as a percentage, or profit before income tax divided by total revenue. Our survey results place the average age of Canadian contractors in 2018 at 49 years old. Compared to our 2016 survey results, the total percentage of contractors under 55 remains relatively unchanged over the two years. What did change is a drop in the number of contractors between 56 and 65 years old, and a spike in those over 65. 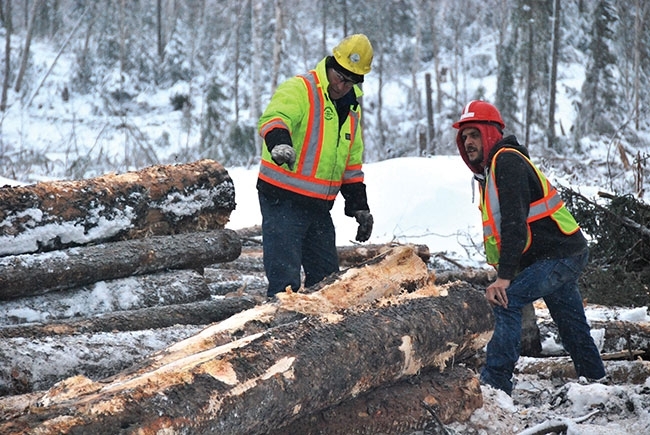 This may help explain why there was an increase in the number of loggers expecting to leave the industry in five years or less, which in 2016 was 28 per cent, and in 2018 is 36 per cent. The retirement issue is most pressing in B.C., Ontario and Atlantic Canada where the average age is over 50. 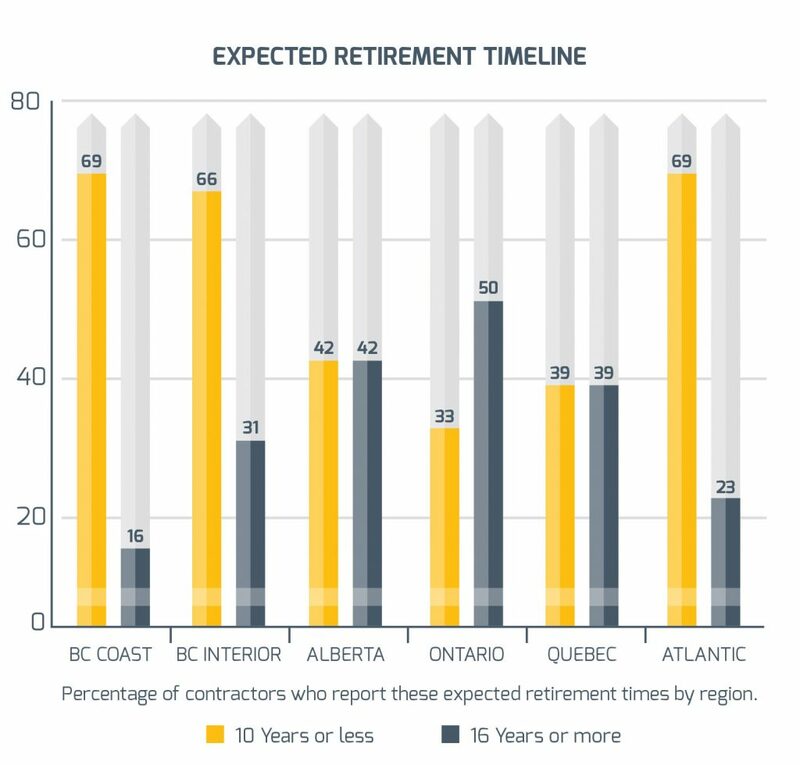 In all three regions, more than 40 per cent of contractors are over 56 years old. Nearly half of B.C. contractors (46% on the Coast and 47% in the Interior) say they will be out of the industry in five years or less. 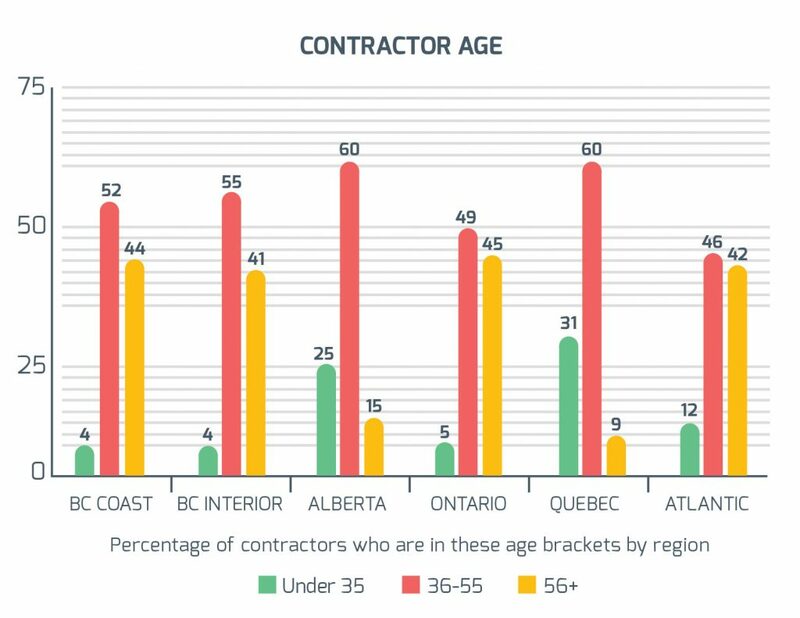 Quebec continues to have the lowest average contractor age of just 40, while Alberta is in the middle at 46. An encouraging sign is that at least a quarter of contractors in those regions are under 35. While retirement numbers aren’t radically different from results in our 2016 survey, what does stand out is the number of loggers who admit to having no succession plan. Forty per cent of contractors in 2018 say they have no plan for their business after they retire – a 15 per cent jump compared to 2016 results. Fewer loggers are willing or able to have their children assume control, which dropped to 20 per cent from 27 per cent in 2016, and slightly fewer have managers interesting in taking over, six per cent in 2018 compared to nine in 2016. That leaves 74 per cent of loggers with no real plan for their business. Forty per cent have no succession plan, 20 per cent will auction and shut down, and 13 per cent hope to sell to another contractor. Loggers in Ontario are the least likely to have a succession plan at 67 per cent, although that region also has the highest number of contractors planning to stay in the industry 16 years or more. Selling to another contractor is a popular response in Quebec and the B.C. Coast, while B.C. Interior and Atlantic Canada loggers hold out the most hope for their children to take over. On average, forestry equipment operators and drivers across Canada earn $29 per hour, although, not surprisingly, the rates vary significantly by region. Operators on the B.C. Coast earn the most, with an average rate of $37 per hour. The wages decrease as you go east, with Atlantic Canada operators earning the lowest wage at an average of $20 per hour. When compared to the results from our 2016 survey, fewer operators are making more than $26/hour in 2018, although the number is still well over half at 62 per cent compared to 66 per cent in 2016. A handful more operators make between $21 and $25/hour – 18 per cent in 2018 compared to 17 per cent in 2016. While more operators earn between $16 and $20/hour in 2018 (13% compared to 9% in 2016), no contractors are paying less than $15/per hour in 2018, whereas three per cent of operators earned this wage in 2016. When asked how much their main cost centres changed in the past three years, well over half of the respondents say machinery purchase as well as parts and service and fuel have all increased significantly. The cost of labour, hauling, supervision, insurance and finance have increased at least slightly for at least half of contractors. These numbers are similar to what we saw in our 2016 Contractor Survey when asked the same question, with one notable exception: the cost of fuel has jumped over the past three years. Fifty-three per cent rate fuel costs as rising significantly, and another 39 per cent say it has increased slightly. In 2016 more than 50 per cent reported fuel costs had dropped, a welcome relief when almost every other cost had increased. Higher costs may help explain why there was a jump in the number of contractors across Canada who own just one to three machines. In our 2018 CFI Contractor Survey, a quarter of loggers say they own between one and three pieces of equipment, excluding pick-ups. This is up significantly from 2016 results, which saw 15 per cent who own 1-3. Given all the financial challenges outlined, it’s not surprising that 74 per cent of loggers see financial compensation as the most important part of the industry to improve in order to attract replacement contractors. Co-operation with the wood buyers (40 per cent) and simplification of regulations and procedures (33 per cent) were also ranked high in order to attract new blood. When comparing these results to our 2016 survey, employment stability is less of a concern today than it was two years ago. In 2016, 53 per cent of loggers saw stability as an area that needed improvement, while just 31 per cent chose this answer in 2018. The complete 50-page 2018 CFI Contractor Survey can be found here, in an easy-to-read digital flipbook, free of charge. Thank you to our generous sponsors of the 2018 survey, who made this project possible: Tigercat and Hultdins.